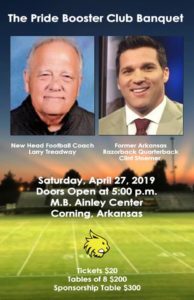 The Pride Booster Club Banquet will be Saturday, April 27, 2019. Doors will open at 5:00 p.m. at the M.B. Ainley, Jr. Community Center, 536 E. Elm Street, Corning AR 72422.